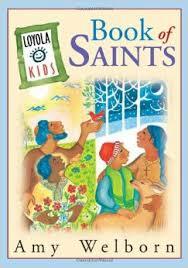 From the Loyola Kids' Book of Saints by Amy Welborn. Because he had spent all those months in his sickbed, Ignatius got bored. He asked for something to read. He was hoping for adventure books, tales that were popular back then: knights fighting for the hands of beautiful ladies, traveling to distant lands, and battling strange creatures. But for some reason, two completely different books were brought to Ignatius. One was a book about the life of Christ, and the other was a collection of saints’ stories. Ignatius read these books. He thought about them. He was struck by the great sacrifices that the saints had made for God. He was overwhelmed by their love of Jesus. Ignatius decided that he would use the talents God had given him—his strength, his leadership ability, his bravery, and his intelligence—to serve God and God’s people. While Ignatius continued to heal, he started praying very seriously. God’s peace filled his heart and assured him that he was on the right path. When Ignatius was all healed and ready to walk and travel again, he left his home to prepare for his new life. It wasn’t easy. He was 30, which was considered old in those days, and he was getting a late start in his studies for the priesthood. In those days, the Mass was said only in Latin, and Latin was the language all educated people used to communicate with each other. Ignatius didn’t know a bit of Latin. So for his first Latin lessons, big, rough Ignatius had to sit in a classroom with a bunch of 10-year-old boys who were learning Latin for the first time too! That takes a different kind of strength, doesn’t it?